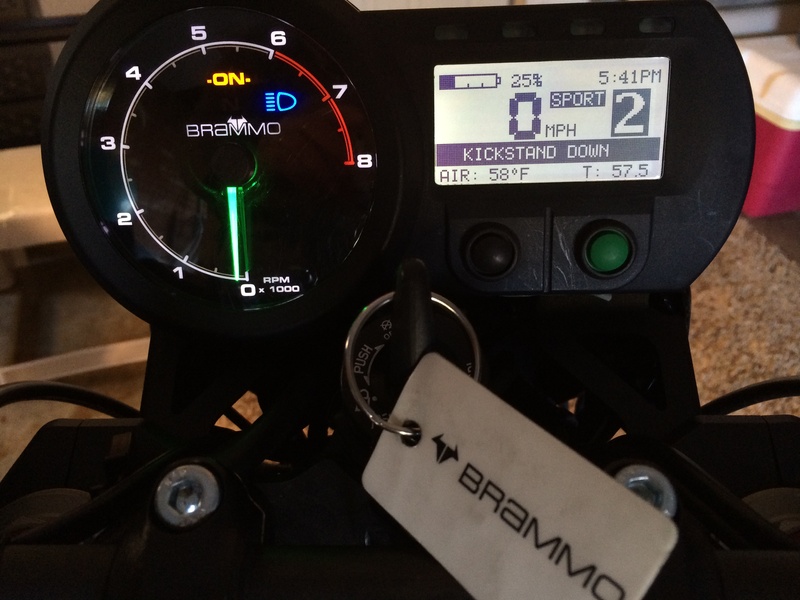 BrammoBlog version 2: edition something or another…I’ve kinda lost track. Ok…it’s been a while. Life continues to be beautifully hectic. I wouldn’t have it any other way. Still, it’s tough to get in some “lets write on the blog today” time. And I, like too many times before, have no theme for today’s blog. So it is another Mish-Mash Photoblog. As I always say, more photos and less me is a good thing. So this winter has been very mild compared to the rest of the country, especially the Eastern part. Little snow and mostly warm days. Heck, next Sunday, Feb 16th, it is suppose to be 70 degrees. That wouldn’t be surprising in San Diego, but we are a mile above sea level and actually get winter here in Albuquerque. First photos are from a week or two ago. 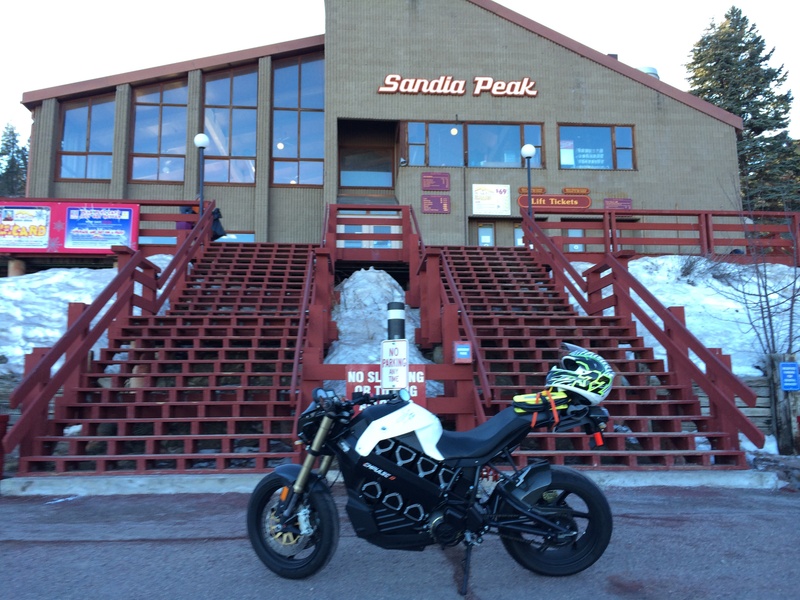 It was in the mid fifties in town, so I thought, “Hey, it’s beautiful here in town, I should take a ride up to the top of the Sandia Mountains.” This was, as my lovely wife pointed out when I got back, a silly idea. The mountain is always 25-35 degrees colder, and usually much windier, making it feel even colder. She said, rolling her eyes (more on that later)**, “Gavin, it’s lovely here in town. Why ride up the mountain when you could have taken a beautiful, and warm, ride along the Rio Grande?” Damn…But she is smart and I am dumb. Plus I wanted some snow photos. I hit a milestone on the ride. 5000 miles. 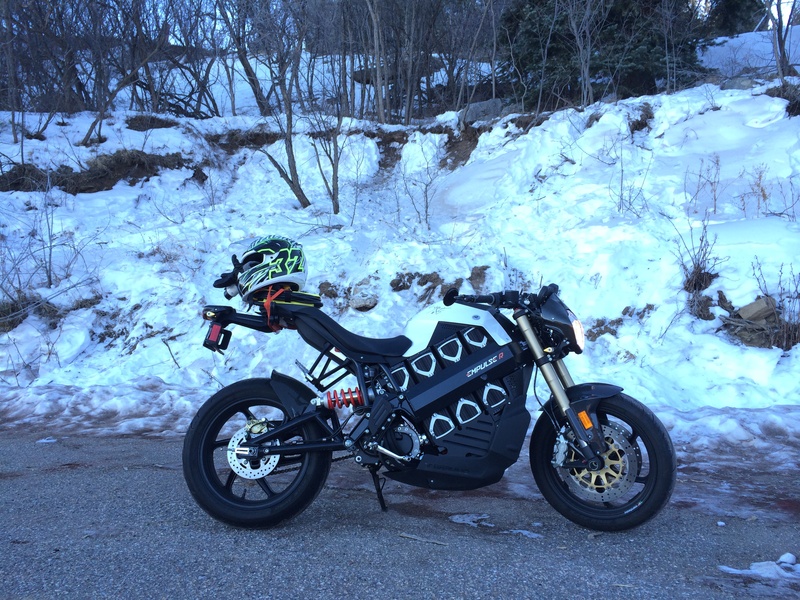 Now I’m a year round rider…but I have a short commute. So to some, especially those people in California with nice weather and crazy long commutes to work, 5000 miles isn’t a lot. But for me, well I usually put 5000 miles a year on any bike I own. 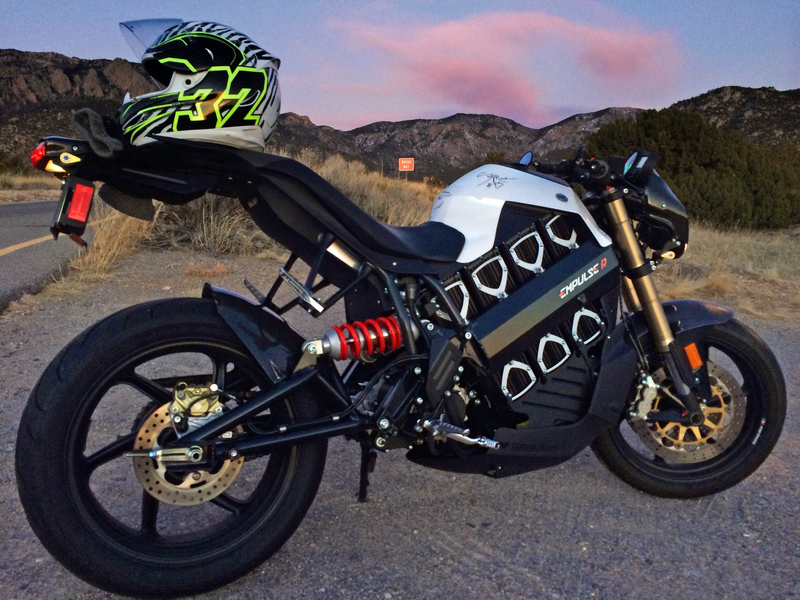 So the Empulse is just like another bike. 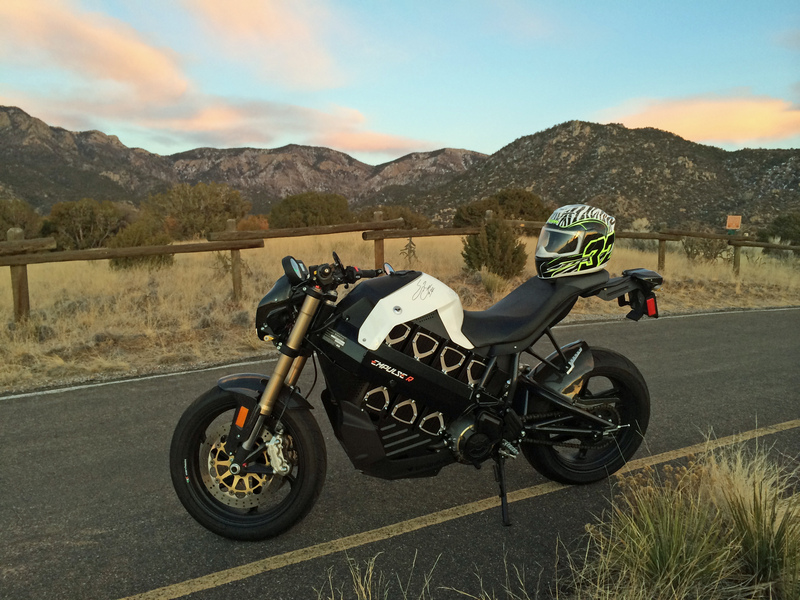 In other words, I treat my electric motorcycle like I treated my previous motorcycles. And that is a good thing. I got a late start on the ride. It was really 3 o’clock…I am horrid at changing my clocks with daylight savings time. I was about 4 miles into my ride when I stopped to get that photo. I would have to hurry a bit to get up the mountain and back before it got really cold and dark. The backside of the mountain faces East and gets dark well before the west side where Albuquerque lies. I’m at the Ski Basin parking area at around 8,600 feet. The peak is another 2000 feet…but I didn’t make it that far this day. I stopped here as my start was a bit too late. Maybe next weekend. But I did get some photos. 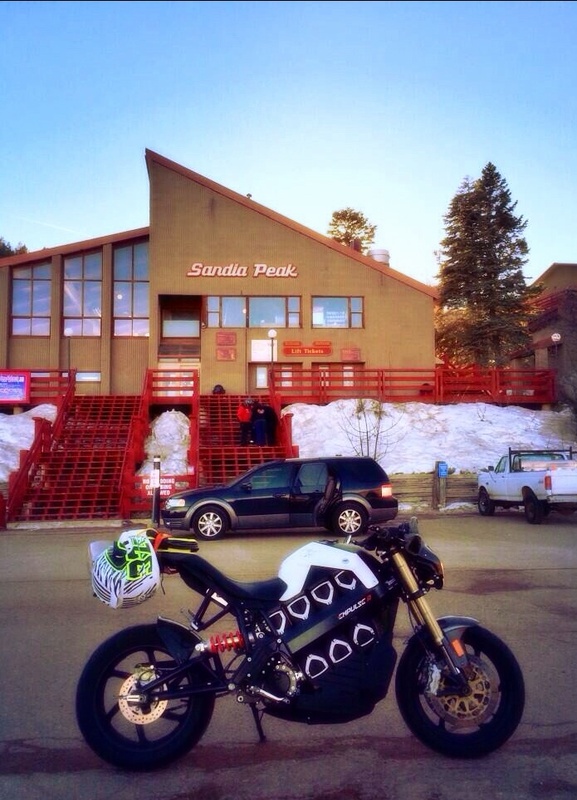 Sandia Peak Ski Area. I park where I want. Plus the ski day was over and only a couple of people where left. I used a twitter photo treatment here to get the dreamy effect from my iPhone. One day I’ll have to get a nice camera, but the phone is just so convenient. Sad story…see the people on the stairs? They where helping a young man, 12 or 13, down the stairs. He had a leg brace and arm brace…obviously he had an accident on the hill and was in temperory casts till he could get proper care in town. One of the people, likely his brother, was helping him but was still wearing his ski boots. Walking down stairs in ski boots is hard…walking down stairs in ski boots while helping an injured person is near impossible. He stumbled, fell and took his brother down with him. It was painful to see, and to hear…I went over to help, but there were enough of them helping. Slowly, after much screaming, they got him to the car. After that I really didn’t want to keep going to the top and decided to get home while I was still healthy and whole. Casts and braces and screaming made me realize that going further on the slightly icy roads was probably not a wise choice. So, 58 degrees at home. Below freezing at the ski area. 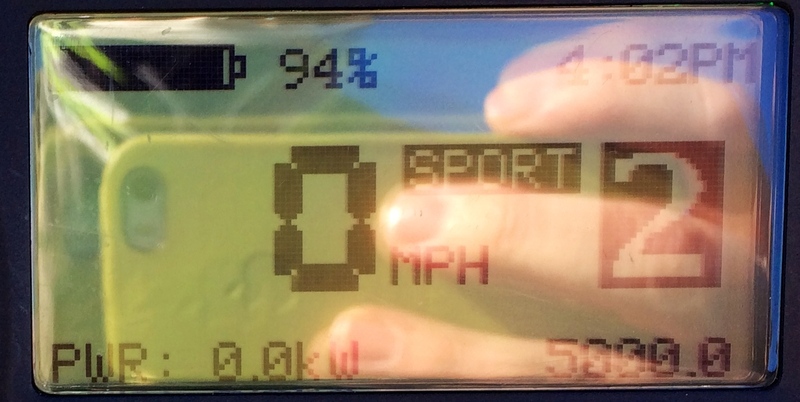 Almost 60 miles round trip. Use 75% of my battery. A nice ride. A river ride would have been smarter. So that was a couple of weekends ago. 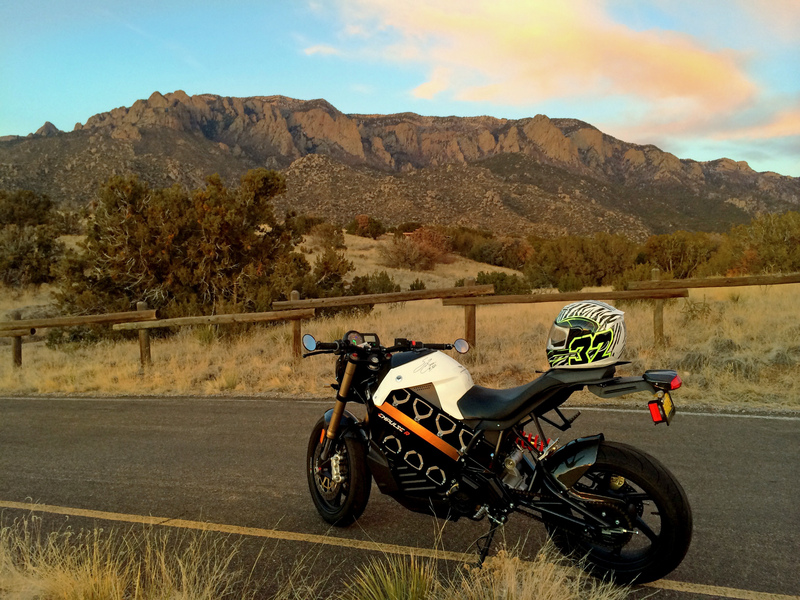 This weekend I was at home and I took a ride just before sunset. I thought, “Gavin, you should get a nice sunset photo up in the foothills at the base of the mountain.” And so…. Up at Elena Gallegos. A nice picnic area. These photos are facing to the East, away from the setting sun. You can see the orange of the sunset reflected on the battery support bar. Panorama. Click, if on the internet, to make bigger. Panorama. I cast a long shadow. Like Peter Pan, I often have to sew my shadow’s feet to mine or it runs away. Also facing East…but a bit later as the sun was further down. The iPhone is not great at taking photos into the sun. I had to play with this a bit and it is still grainy. Oh well. Still pretty. I got the sunset photo bug the day before taking those photos. I was leaving my brother’s house just at sunset and took a nice sunset photo. 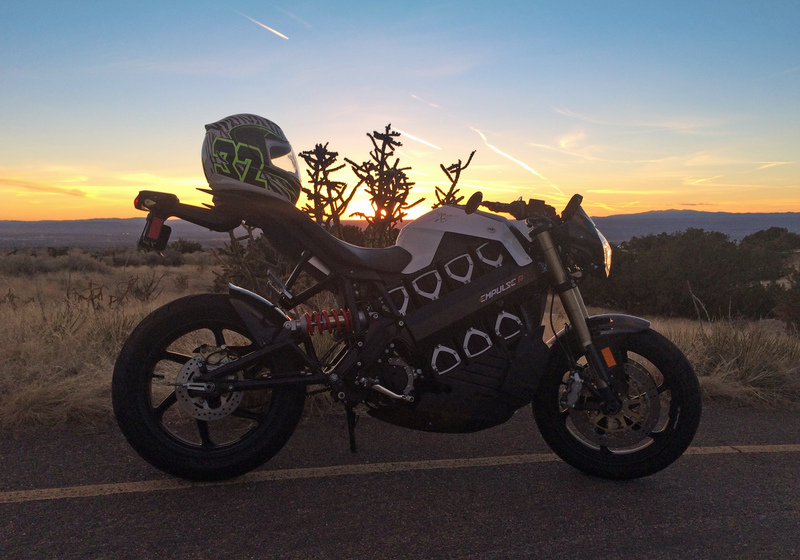 Now to get a photo of the bike and the sunset is tough. 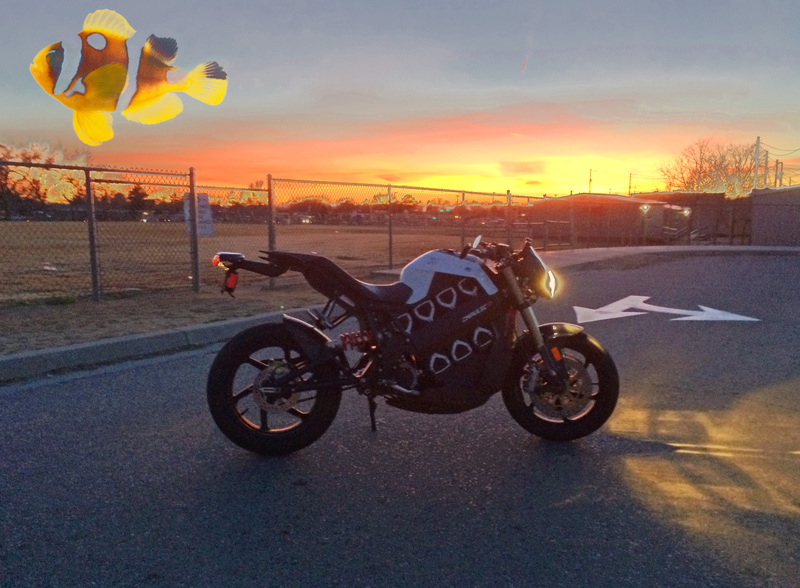 Usually the bike is way too dark, or the sunset is way too washed out and bright. So what I sometimes do is take 2 photos and merge them. One focused on the bike and the second focused on the sunset. So that day I took two photos and downloaded them to my computer. When I went to merge them I mistakenly added a third photo. So my final merged photo added a little something to my sunset image. This is my Photoshop Fail photo…though I do like it. The Clownfish photo fits in very nicely with the color scheme. Happenstance can be a wonderful thing. We get a lot of orange and pink sunsets in New Mexico. Let’s keep with the theme of random recent photos. I was with my brother and his wife for a bite to eat at 2 Fools. An Irish pub in town. I parked out front like I always do. There is never an spaces as the pub is in a busy area of Knob Hill near the University of New Mexico. But I can always find space between two cars. That nights spot was a biggish space and not at all a tight fit. I parked dead center giving good space for the cars to easily get out without hitting my bike. 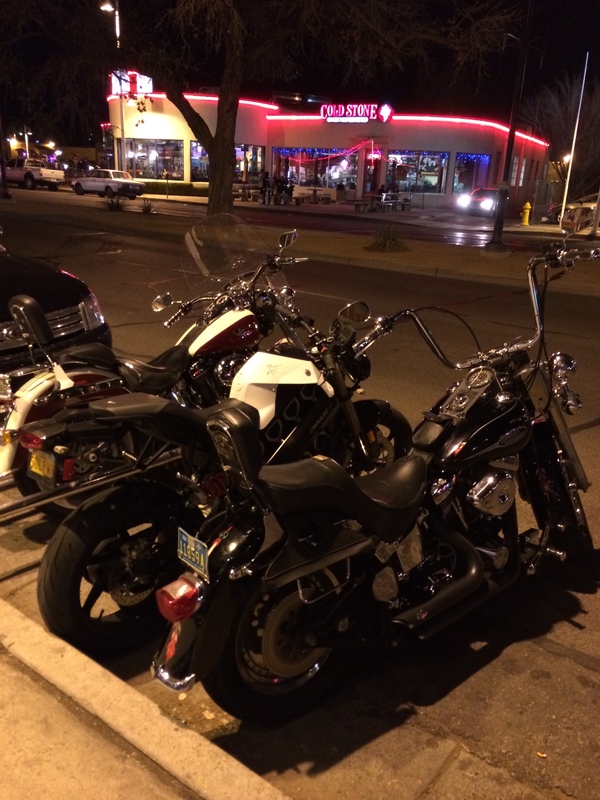 I come out and two Harleys have parked on either side of my bike…very close to me. In fact, I wouldn’t have been able to move my handlebars if the bike to my right didn’t have a raised handlebar. No harm, no foul…just hope that if I ever cram in next to them that they don’t get bent out of shape over it. It was a bit tighter than the photos shows it. Nothing horrid. I’ve parked that close to friends before. But that was friends. I was the Street Fighter meat in their Cruiser sandwich. 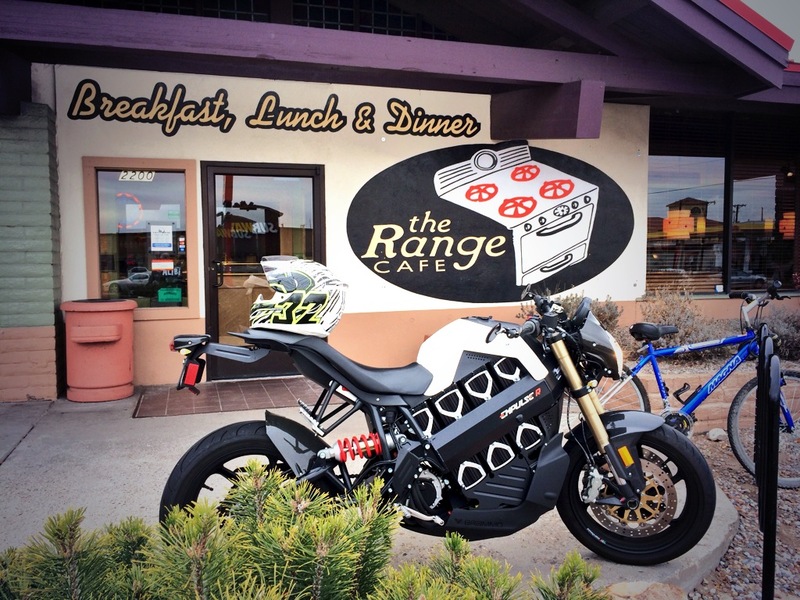 Speaking of sandwich…I took a ride on the Range…. Or “to the Range” would be more accurate. Yummy wedge salads and wonderful green chili stew. Well that about does it for this blog post. Not as exciting as some posts…better than others. I was riding home from a Farmington clinic when I saw this building. 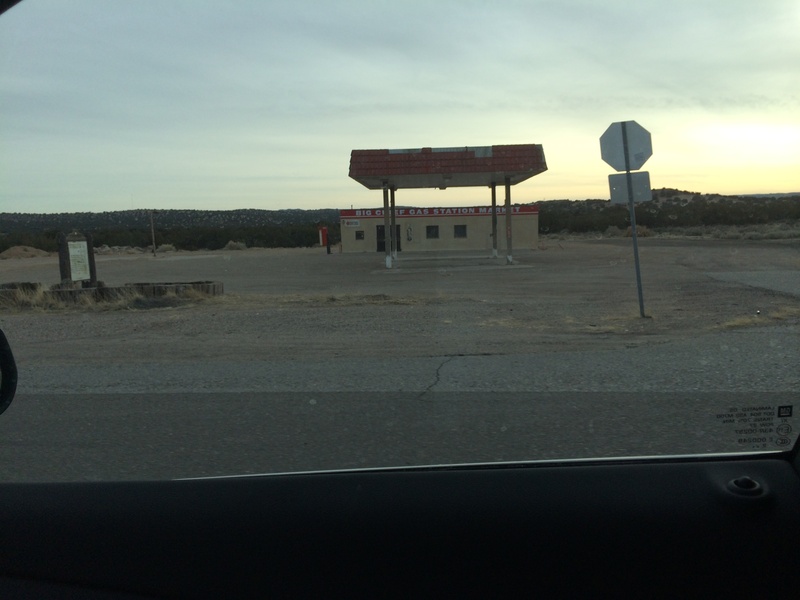 I was pretty sure it was a site used in Breaking Bad…but it looked more run down than I expected. So I grabbed a quick photo as I drove past. I know Breaking Bad is over, but I can now add this to my list of known sites. I will have to jump on the Empulse and get a photo one day soon. It will be the furthest site on my pretend tour. 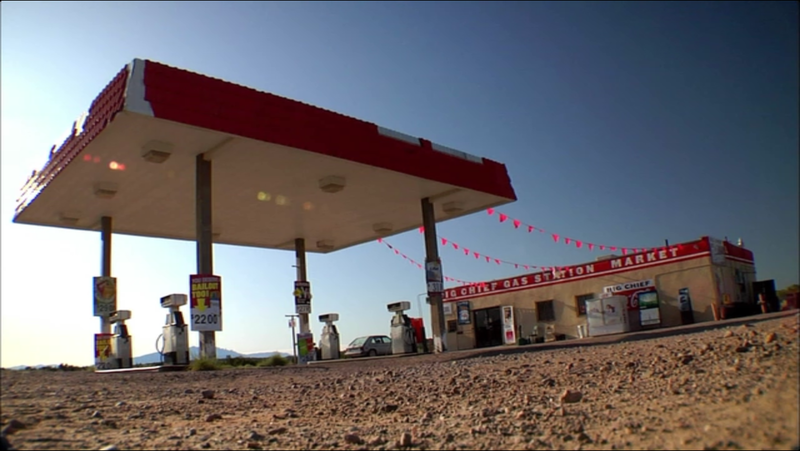 It is an abandoned gas station near the Zia Pueblo. Every September during mating season when the male tarantulas are out looking for love I will stop my car on the road whenever I see one of these 8 legged Casanovas to make sure they don’t get run over. One time an especially lethargic tarantula was taking too long, so I took of my sweater and let him climb on it and then dragged him across the road. My wife was sitting in the car, rolling her eyes and shaking her head. Like making a circle on your stomach with one hand and tapping your head with the other, it’s tough to do. But it is possible with practice…and she gets lots of practice with me around.